Now that the school has finished operation after 43 enjoyable years, there are a few tools for sale and a pile of miscellaneous scaffolding lumber, the latter free for the taking. 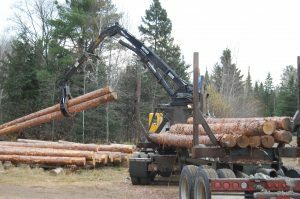 Also, 14 good Norway pine logs for sale – 22-28 footers. For details see the Newsletter on this website or phone 1.218.365.2126. See notes below and understand that this website is being left up for informational purposes even though the building courses will no longer be offered. There are good data on safety procedures, lists of gear you will need to do your own building and other resources. For further questions, feel free to phone Ron Brodigan at 1.218.365.2126 anytime. See note #1 below. Ron’s newly-launched consulting enterprise, Great Lakes Log Building Consulting, is a business member of the International Log Builders’ Association (ILBA) headquartered at Montebello, Quebec, and advice given is mainly in accordance with the Association’s Effective Practices & Methods for Handcrafted Log Building. Ron was a member of the committee that revised this document for the ILBA in 2010. Lectures and slide presentations may also be available. In addition, Ron has owned, operated, and maintained a number of loader trucks, bulldozers, cranes, backhoes, sawmills and other apparatus over the decades. He may be a useful source of advice for anyone contemplating a purchase of such equipment. Inquiries can be directed to him at 1.218.365.2126 or courses@schooloflogbuilding.com. A nice load of Norway (red) pine being unloaded in the peeling yard – just in time for the beginning of a course. We use a variety of wood species for log building. Left to right above are members of a recent workshop: Adam, Eagle River, WI; Eric, Mounds View, MN; Richard, Grapevine, TX; Mike, Lino Lakes, MN; Kevin, Tomahawk, WI; Nathan, Eagle River, WI. On the July workshop (above and below), Jill and Danny from Indiana, Colleen from Netherlands, and Richard from Texas, calculate the kingpost cut, then later pose after completing the roof system. Above: Future log builders: Mark, Minnesota, Todd, Ohio, and Chris, Alaska, finish a log truss for a project on a November workshop. Above: Megan and Sheila work on flattening a cap plate during a July course – making use of a helper handle. If you are thinking of sending a relative or friend on a log building course in 2017 – as a holiday, anniversary or birthday present, tuition gift certificates can be easily and quickly arranged. Call 218.365.2126 for information. Brent and Megan of North Carolina and Sheila and Terry from the Toronto area comprised a July basic and roof workshop. On the June course were Todd, Minnesota, and Chuck and Tammie, Mississippi. The May, 2011 course included Mark, Wisconsin, Shaun, New York, Megan, California. Finishing up a timber-truss on the July, 2009 course are (clockwise) Brett, Ohio; Chris & Debra , Wisconsin; Paul, Minnesota; Robert & his daughter, Alina, from eastern Ontario. The participants in a three-day roof workshop are shown below after the ridgelog was fitted and placed. l to r: Mark, PA; Jon, MN; Scott & Bruce, MN. Bruce trims a kingpost to accommodate the ridgelog. Jeff of Indiana cuts a window on an April course. One of the most successful and enjoyable courses ever held (at least from the instructor’s perspective), the group also included Colin of Manitoba, Marlon of Tennessee and Pat from Ohio. Former students Jim and Nancy Sauer of St. Louis, MO, holding their model in front of their almost completed home, done during 2007-07 of yellow pine with help from their son and a friend. See more pictures below. During May 2007 Stonework Course, Jennifer, Illinois, sifts clean mortar sand while Tony, Wisconsin, mixes. Jim and Nancy Sauer from Missouri brought to the June, 2006 class their model of the house they would build. After some modification, the house now well underway, the revised mockup of the house is shown below with their son, Mike, and Bruce Gibbar, who were participants on the June 2007 course.